At Autumn Lodge our standard of catering is excellent, with the chef providing meals which suit both ethnic and personal preferences. All our meat is fresh and delivered from our butcher with twice weekly deliveries. We also enjoy fresh fruit and vegetable delivered by our local provider three times per week. Our chef prides himself on providing high standards and nutritious meals, with vegetarian options and any special care requirements. 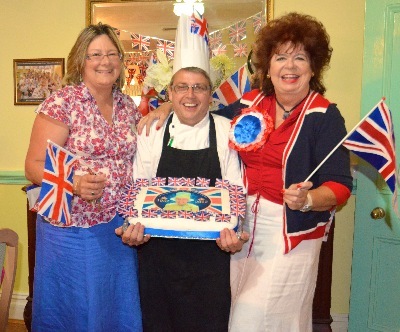 He bakes daily to give us fresh home-made cakes for afternoon teas and birthday parties. Our themed entertainment days give our chef an opportunity to show his skills - his famous Steak and Guinness Pie is a great tradition on St. Patrick's Day or homemade Leek Soup on St. David's Day are all part of our unique catering service. Our daily Hotel-style Sweet Trolley is always a mouthwatering, tempting delight, with sherry a regular aperitif. Breakfast is served between 8:00 am and 10.30 am with a choice of either room service or in one of our two dining rooms. Hot Suppers are provided and hot or cold drinks served at regular intervals throughout the day and evening. Extra snacks and teas are always available. We are very proud of the standard of food provided at Autumn Lodge and, in 2007, we received 5 stars out of 5 in the Brighton and Hove ‘Scores on the Doors’ scheme. Homemade Cottage Pie, Fresh Broccoli, Sweet corn. Hot Chocolate Sponge Pudding with Custard, Strawberry Cheesecake, Homemade Fresh Fruit Salad, Fruit Jelly, Selection of Ice cream. Homemade Chicken Korma, Saffron Rice, Fresh Salad, Naan Bread. Homemade Lamb Stew and Dumplings, Parsley Potatoes, Fresh Seasonal Vegetables. Homemade Lemon Meringue Pie with cream, Home-made Blackcurrant Cheesecake, Homemade Fresh Fruit Salad, Fruit Jelly and Selection of Ice Cream. Homemade Steak and Guinness Pie, Garlic Roast New Potatoes, Fresh Seasonal Vegetables. Hot Creamed Rice Pudding with Jam, Homemade Strawberry Gateau and Raspberry Mousse, Fresh Fruit Salad, Fruit Jelly and Selection of Ice Cream. Smoked Haddock with Cheese Sauce, Homemade Creamed Potatoes, Carrots and Peas. 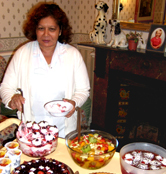 Homemade Apple Crumble and Custard, Chocolate Mousse, Homemade Fresh Fruit Salad., Fruit Jelly and Selection of Ice Cream. Homemade Lasagne, Garlic Bread, Fresh Seasonal Vegetables. Homemade Bread & Butter Pudding and Custard, Homemade Gooseberry Mousse, Peaches and Strawberries with cream, Fruit Jelly and Selection of Ice Cream. Homemade Roast Turkey and Yorkshire Pudding, Sage and Onion Stuffing, Cranberry Sauce and Gravy, Roast Potatoes, Fresh Seasonal Vegetables. Homemade Strawberry Meringue Nests with cream, Chocolate Fudge Gateau, Homemade Strawberry Mousse, Fresh Fruit Salad, Fruit Jelly and Selection of Ice Cream.